Atmocean uses wave energy to pump seawater to shore. Our industrial partners are able to desalinate the seawater using the pressure alone with no external energy source. The resulting fresh water is then put through hydroponic drip irrigation systems able to irrigate green houses located on 15-30 hectares of land. This allows us to grow food, create jobs, and sink carbon throughout the world’s coastal deserts. The seriousness of carbon emissions and the resulting impacts of those emissions are starting to have a strong effect on our global environment. From the melting of glacial systems around the world to the increasing intensity of storms and droughts, never has humanity faced a greater challenge than what lies before us today. 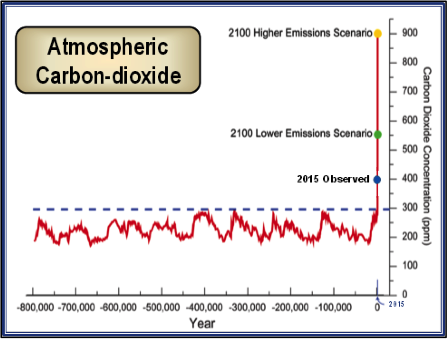 One only has to observe the historic CO2 levels over the last 800,000 years and compare those numbers to where we are today at 400ppm to get a clear picture. While governments talk about reducing emissions, that is only one side of the story. In fact, carbon sequestration, which is the draw down of carbon already in the atmosphere is equally critical in the fight against climate change. As there are many ideas out there to realize this, we look for solutions in the best converter of carbon that have been around for millions of years; plants and better still, food crops. Having located two industrial partners in desalination and drip irrigation, Atmocean has all the parts to make this solution a reality and do it at an affordable price. 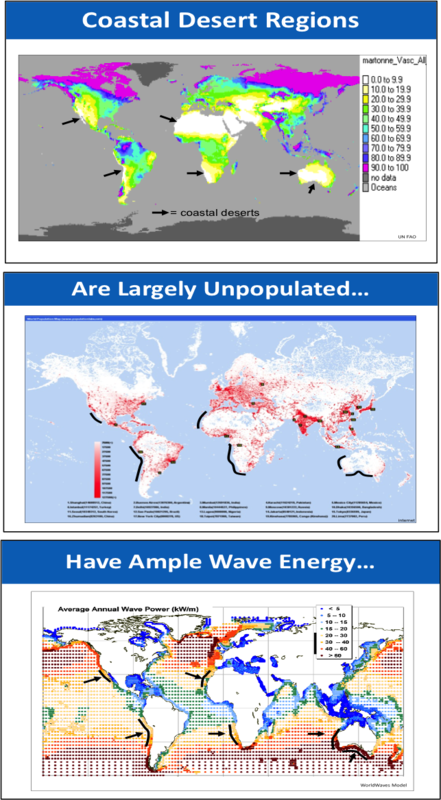 In addition, there are substantial coastal areas with great wave conditions, no rainfall, and sparse populations thereby holding no current land value. These areas, largely located on the west coast of South America, Australia, Africa, and Baja Mexico equate to roughly 11,000 km of available coastline for greening projects and thus a tangible opportunity to realize CO2 reductions. SUSTAINABLE AGRICULTURE: Each project supports up to 30 hectares of new greenhouse cropland in arid coastal regions. By using desalinated seawater to drip-irrigate crops, Atmocean is not depleting over-allocated ground water or aquifers. The Atmocean zero-electricity reverse/osmosis (ZER/O™) desalination technology operates off-grid and emits no CO2 in the desalination process. FISHERIES: As marine fishing closures come into effect, fishery stakeholders may be forced to move away from their livelihood. “Greening” opens jobs in marine security & operations, water processing, agricultural operations, and system management – essentially re-purposing these stakeholders within the community and avoiding the difficult decision to move away. In addition, Atmocean arrays help restore the ocean ecosystem as they act as de facto Marine Protected Areas or MPAs. These artificial nurseries allow natural fishing stocks to recover, setting the area on course for future fishing opportunities. RURAL DEVELOPMENT: By triggering economic opportunities, jobs, and income in rural coastal areas, the local population has less incentive to move to overcrowded cities, where they often start on the “bottom rung”. Less migration to crowded cities means less poverty, better use of existing infrastructure, enhanced delivery of social services, and other benefits/savings. RENEWABLE ENERGY: Atmocean’s ocean wave energy system delivers pressurized seawater onshore to its ZER/O desalination modules. This is the first commercially practical and economically feasible use of wave energy worldwide. Each array of 15 seawater pumps occupies just 60m by 60m ocean surface – located in rural coastal areas, away from shipping and most conflicting uses. FRESH WATER: Atmocean’s ZER/O technology directly increases the supply of fresh water for sustainable agriculture, in coastal desert regions where water supply already is over-allocated or more likely, not available. CLIMATE CHANGE: Atmospheric CO2 levels, mostly due to burning fossil fuels, are above 400ppm, the highest in 800,000 years. CO2 is scientifically proven as the primary moderator of global temperatures. Excess CO2 traps heat in the atmosphere. Direct outcomes include: widespread warming which affects human health, increased variable agricultural productivity, more powerful storms & flooding; sea-level rise from ice cap & glacial melting; ocean acidification; reduction of plankton levels (the source of half our oxygen) from warming oceans; and many other negative feedback cycles. Yet global political leaders continue to subsidize fossil fuels, even in spite of the signing of the Paris Climate Accord. Action is needed by business and private investors to mitigate the rise in CO2. By greening the coastal deserts, Atmocean makes a dent in this problem, as the green cropland absorbs atmospheric CO2 by photosynthesis and does so while taking into account people, environment, and the economy.